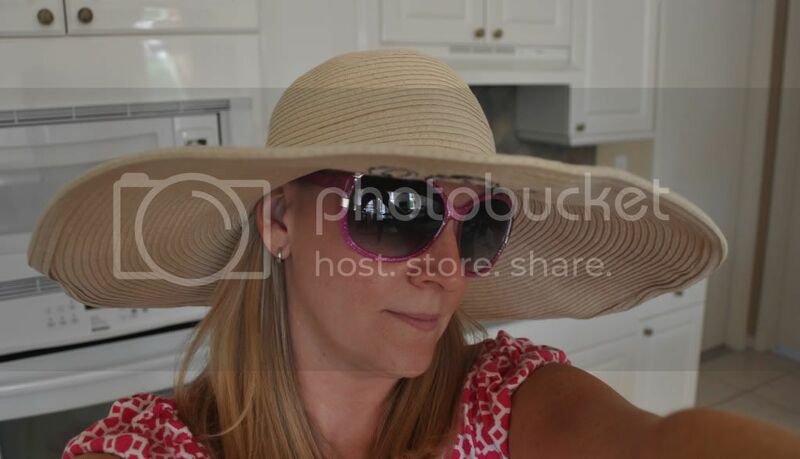 I am so excited about my new sun hat from Marley Lilly. I was going to get pink (no shocker there!) 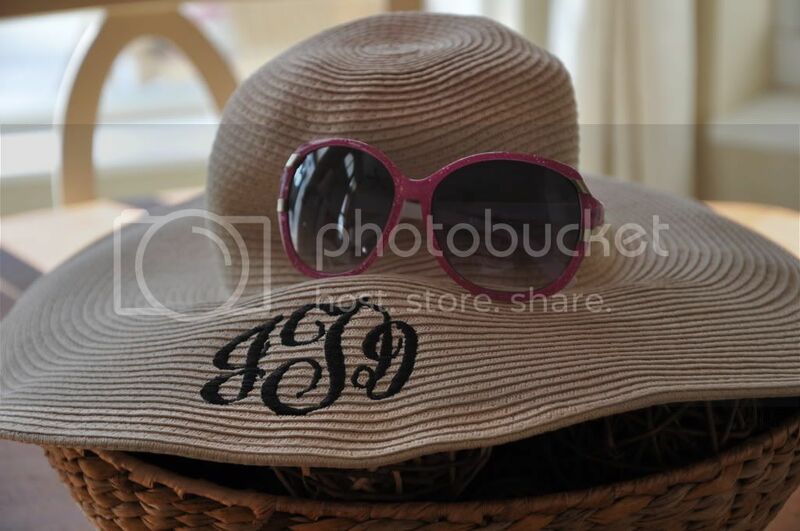 but Husband convinced me to get a straw colored hat with a black monogram. Much more versatile for all outfits. Thanks Husband! You were right. Please don’t read too much into this, honey. Thanks! I’m also loving my new sparkly pink sunglasses. CVS $7.99 special y’all! 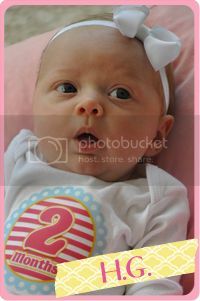 So how did I come across these fantastic babies? Sunday, we woke at 5:30 am to take my in-laws back to the airport. I forgot my sunglasses (it was dark). We decided on the way back home from Fort Lauderdale to head to Lion Country Safari in West Palm Beach. We stopped at CVS for sunglasses and sunscreen (I have a deep devotion to CVS and love the extra care bucks). Here’s my pitiful attempt at a self portrait. 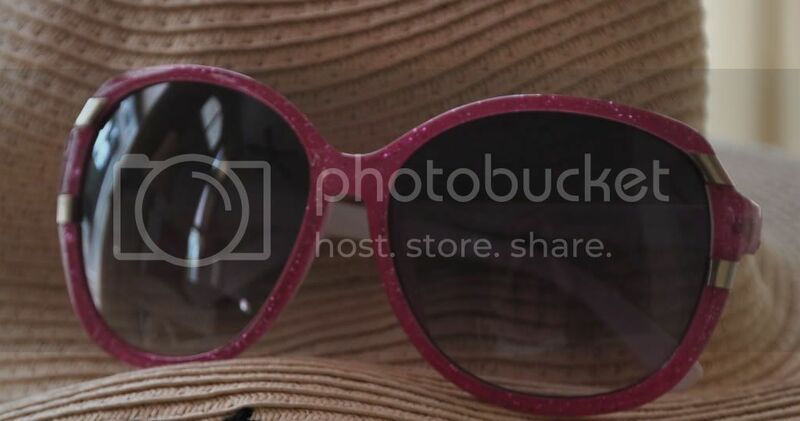 Fabulous (and HUGE), pink, sparkle sunglasses with my Marley Lilly hat. No really, they make my cheeks sweat. I didn’t know cheeks could sweat. Other things I’m loving….our new fish, Gills. Actually, he’s not our fish, but he’s spent most of the summer at our house. He belongs to one of the three little boys that lives across the street. 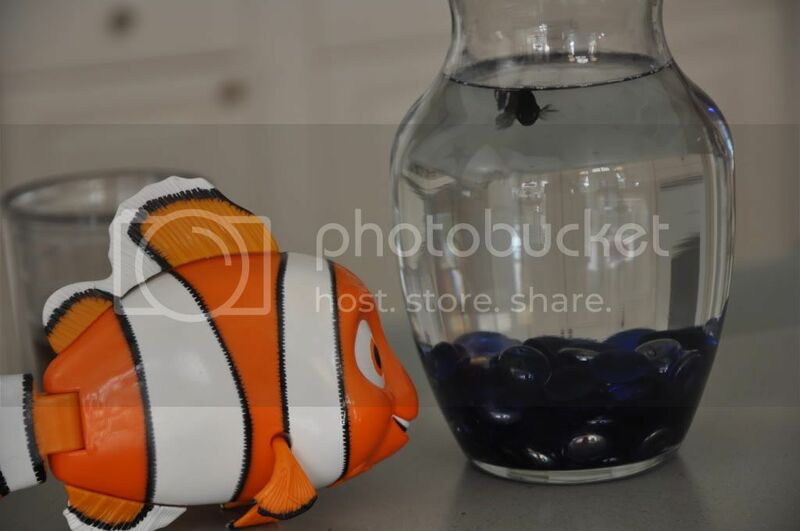 Gills found a friend in Nemo (which is really funny as Gills really did freak out a bit when Nemo first visited. I’ve never seen a fish swim around a bowl in fast circles. Maybe he was just excited). I’ll be sad when Gills leaves. I actually threatened to keep him. Lastly, so excited my new IKEA magazine came in the mail! I pulled out my loyal BIC Mark – It in Fuchsia and started circling and noting all the cool gadgets I plan to pick up on my next trip. I’m always amazed at the quality of their items. They truly don’t have any wear and tear. I have bowls and kitchen utensils that I’ve had for a couple years and still look brand new! Granted, I’m not that modern in style, but I do love the Lack side tables and their endless supply of storage options. HAIL TO IKEA! Why has Gills spent most of the summer at your house? Just wondering? I love it, definitely more fun than laying out in a baseball hat like I usually do, and love the sparkles on the glasses! Have a great day! Gills' family has been out of town most of the summer and Brandon didn't want him to be left alone. I complained the first time because Gills was an awful guest. He refused to eat, would not stay in his bowl, splashed water all of the floor and kept his bowl in a horrible dirty mess! Gills wasn't welcome any more. When I explained this to little Brandon, he looked at me with very confused eyes and said "Really?" Hope your house guest is better behaved ~ ha! J'adore that darling floppy hat! 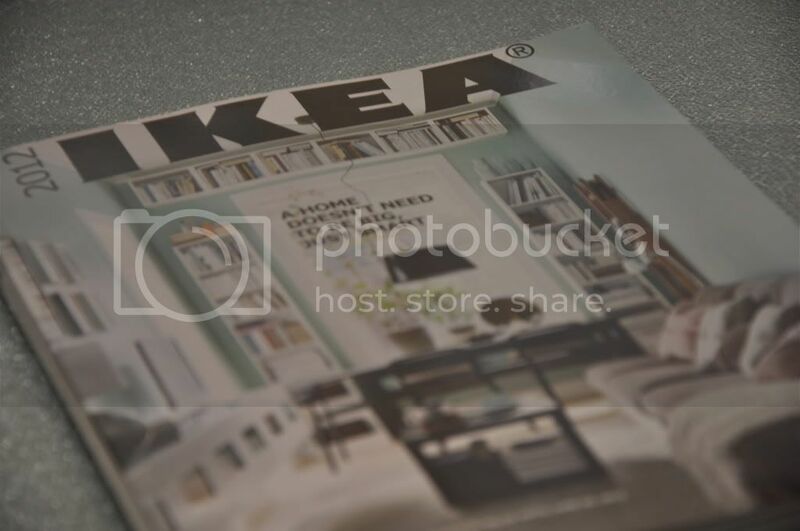 My Ikea catalog is already dog eared...I need to plan a trip again shortly. 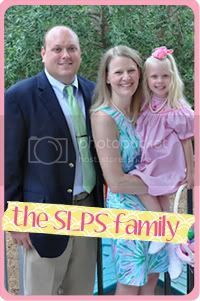 Here is the link and I ordered the straw color with black monogramming. Thanks so much!! I am going to order tonight! Love your blog. 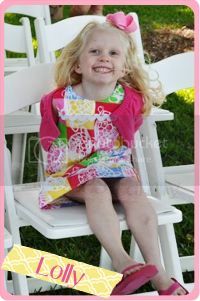 :) I am inspired to learn to sew after seeing the cute dress you made your daughter. Greetings from a Georgian relocated for work to California. 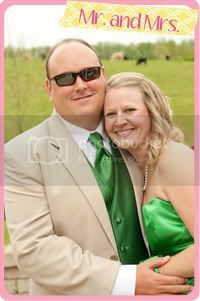 I had those same pink sunglasses and lost them at a Rascal Flatts concert last Friday. I'm _devastated_ and haven't been able to find them anywhere (we don't have CVS out here). Any chance you'd be willing to sell them? Just name your price--I'd be very, very grateful. I don't see a way to email you, but maybe we could connect on your Etsy site if you're willing to sell them. I'll check back in a bit to see if you respond.